A deputy Minister of Education in charge of Tertiary Education, Samuel Okudzeto Ablakwa, has said the ruling National Democratic Congress (NDC) will not allow the opposition New Patriotic Party (NPP) to disfranchise persons on the voters’ register who registered with the National Health Insurance card. He said the government and the NDC party will ensure that no qualified Ghanaian is prevented from voting come the 2016 elections in November. According to the deputy Minister, the motive behind NPP’s move to expunge NHIS card registrants is premise on discrimination against persons they perceived to be non-Ghanaian which the NDC will not allow. "I want to give you full assurance from President Mahama to all 275 parliamentary candidates of the NDC ,we have pledged to protect the vote, we will make sure that every registered Ghanaian on the register votes. We will not allow NPP to discriminate on the fact that somebody registered with NHIS card. We are not going to allow that. Everybody deserves to vote," he said. 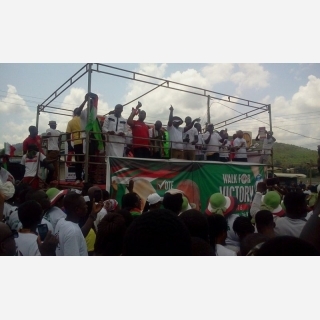 Ablakwa was speaking during a campaign launch by Thomas Ampem Nyarko, NDC parliamentary candidate for Asuogyaman. The parliamentary candidate, who also doubles as the DCE for Asuogyaman, said he has a distinct track record in terms of development and vision for the area hence looking forward to recapture the seat for the NDC and maximize the chances of President John Dramani Mahama. Present at the programme were deputy communication Minister Mr. Felix Ofosu Kwakye, Mrs. Joyce Bawa Mogtari (Deputy Transport Minister) Dr. Zenator Rawlings, John Dumelo, and some Eastern regional Executives.